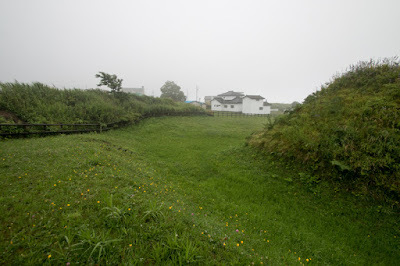 Donan 12 residences (道南十二館, 12 residence at south Hokkaido) are medieval residences of mainland oriented lords spreads along with the shore of Oshima peninsula. 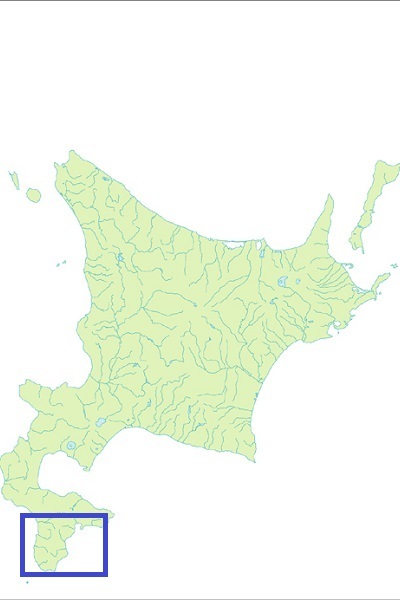 Oshima peninsula is the one at southwest edge of Hokkaido island, protruding from main body like a foot. 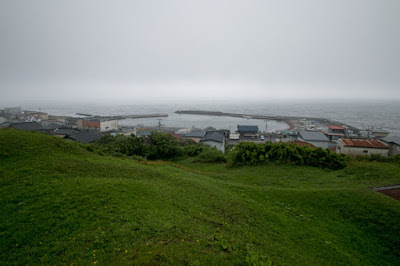 It is the closest area between Honsyu mainland and Hokkaido island, and is only 40 kilometer just apart from Aomori prefecture at the closest points. 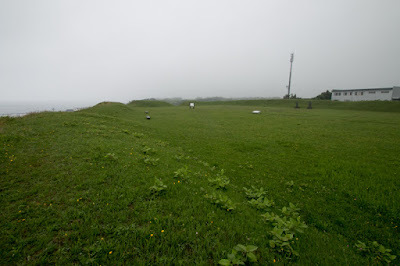 Besides, climate of Oshima peninsula is relatively close to Honshu mainland and almost no heavy snow, and Oshima peninsula also had good fisheries facing Tsushima Current. 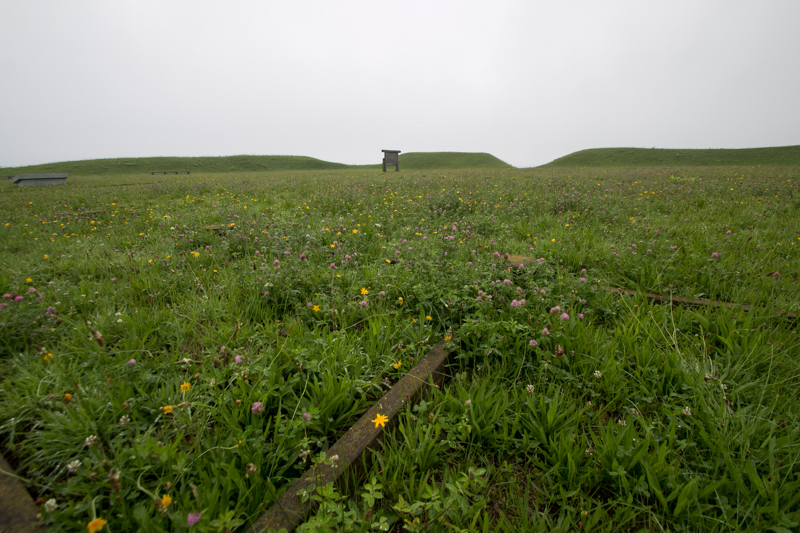 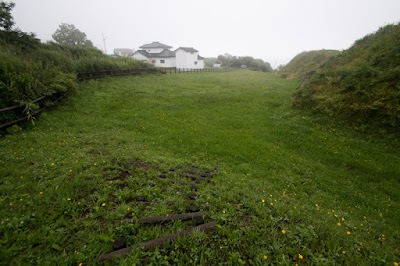 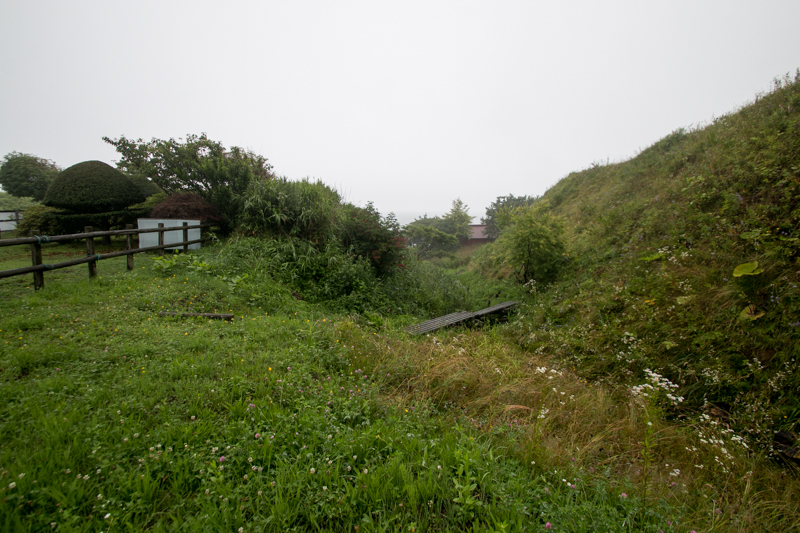 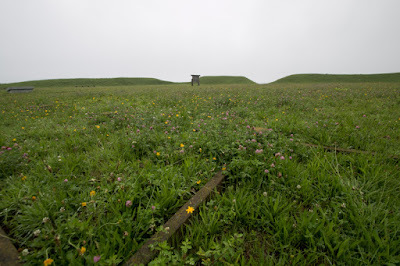 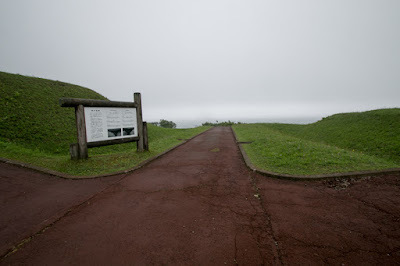 Because of these conditions, Oshima peninsula had been used as a base of settlement of mainland people from early days, but this also means these area were involved into the conflict against local former occupants. 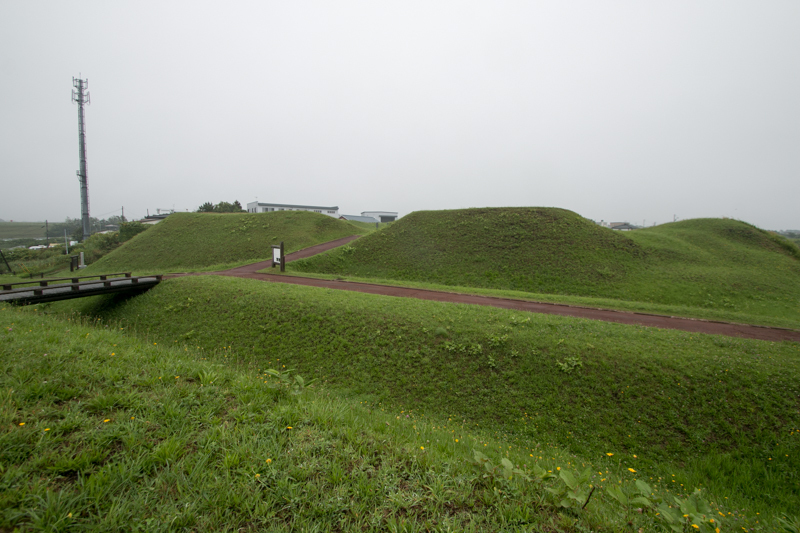 In Hokkaido island, unlike Honshu mainland, a hunter-gatherer culture using earthenware continued long time. 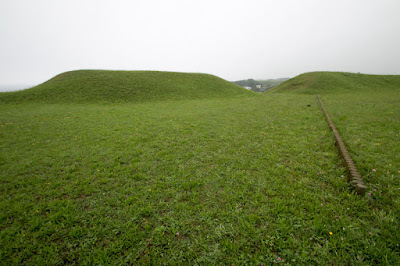 But after 7th century, Satumon era in which limited use of farming with ironware continued by 16th century. 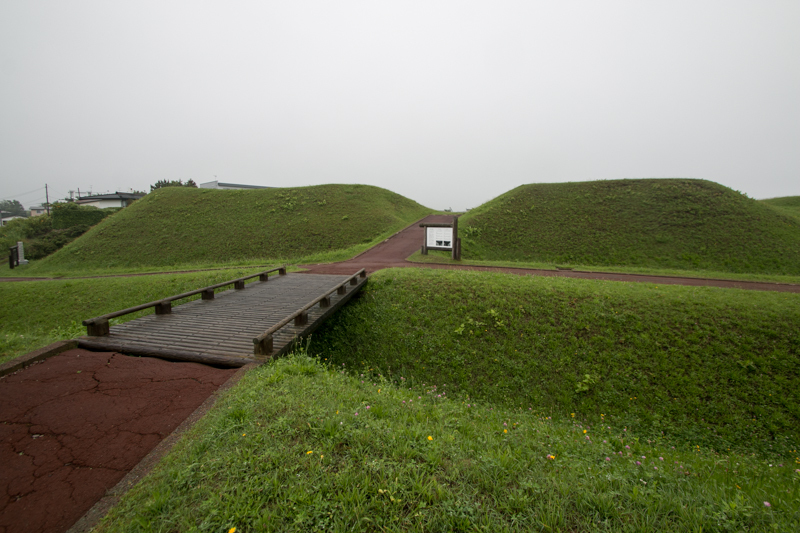 Especially in the south of Hokkaido island, local people acquired culture and items of Honshu mainland by trade, and formed a mixed culture. 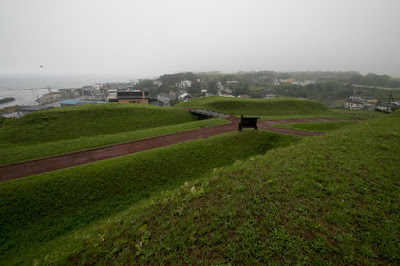 From the view point of Honshu mainland, Yamato dynasty continued expansion toward north from 8th century, and by the end of 10th century they seized south half of current Tohoku region. 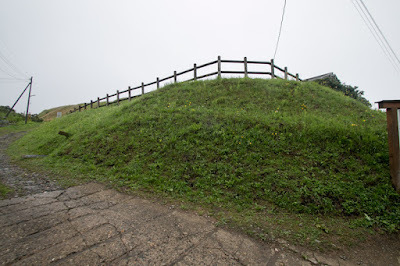 During 11th and 12th century Oshu Fujiwara clan dominated north half of Tohoku region as an semi-independent power, but in 1189 they were extinguished by Yoritomo Minamoto (1147-1199), the founder of Kamakura Shogunate. Now central government wholly grasped all Honshu mainland by its north tip. 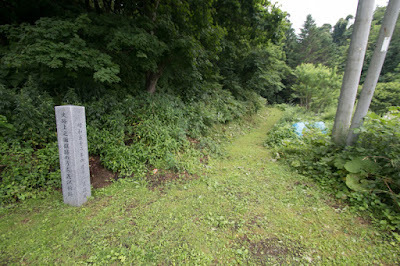 As a next step, on and after Kamakura era, main land people started to cross to Hokkaido island. At first they were exiled people or expelled people, but along with the development of navigation, merchants gradually came to Oshima peninsula. These merchants bought fishes, sea weeds or fur, and sold rice, ironware or goods to local people. These immigrants from Honsyu mainland were called as “Watari” party, and formed colony along the coast. 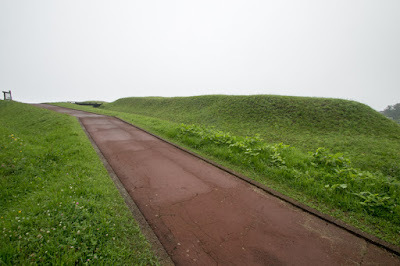 According to the record, in 15th century, there were 12 colonies at Oshima peninsula having residence of the lord, and they were called as twelve residences at south Hokkaido. 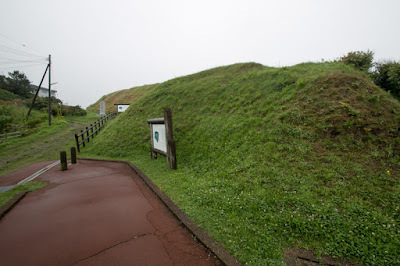 They were controlled by Ando clan, a large feudal lord which held northwestern part of Tohoku region and was nominated as a governor of northern island by Kamakura Shogunate. 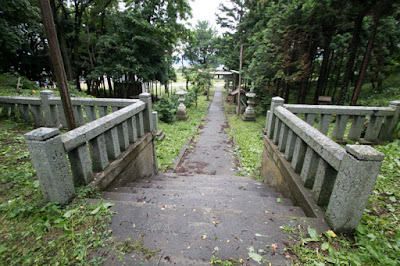 Ando clan divided Oshima peninsula into Kaminokuni (upper area), Matsumae and Shimonokuni (current Hakodate area), and placed their magistrate at each area. According to the official history of later Matsumae domain, these 12 residence were, clockwise from east, Shinoridate (tate or date means residence, Hakodate city), Usugidate (also called as Hakodate, Hakodate city), Mobetsudate (Hokuto city), Nakano tate (Kikouchi town), Wakimoto tate (Shiriuchi town), Onnai tate (Fukushima town), Oyobedate (Matsumae city), Odate (Matsumae city), Nebotadate (Matsumae city), Haraguchidate (Matsumae city), Hiishidate (Kaminokuni town) and Hanasawadate (Kaminokuni town). Many of them were built at a height faces the mouth of the river, to secure the town and fishing area. Considering the power of the lord and population of the colony the size of these castles are relatively large, as they were used as an evaluation place of town people in case of emergency. 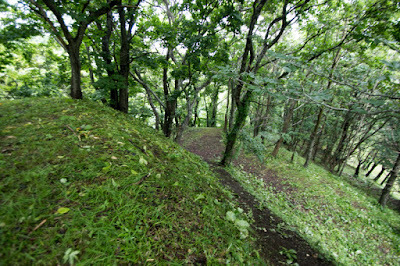 By same reason the clay walls of these castle are tall and wide considering it is still in the former half of Muromachi era. Arrival of mainland people brought various goods to Ainu society, but also brought friction. Because of the nature of the good trade conditions might be inferior to Ainu side, and usage of fishing area evoked conflict. Furthermore, Ainu people imported iron weapons such as sword or arrow through trade, and also learned organization and tactics. 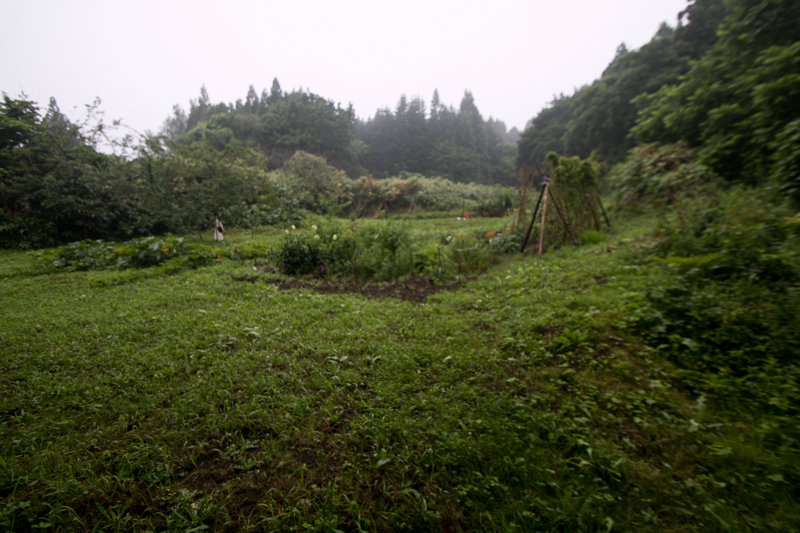 The substantial possibility of rise of local people steadily increased. 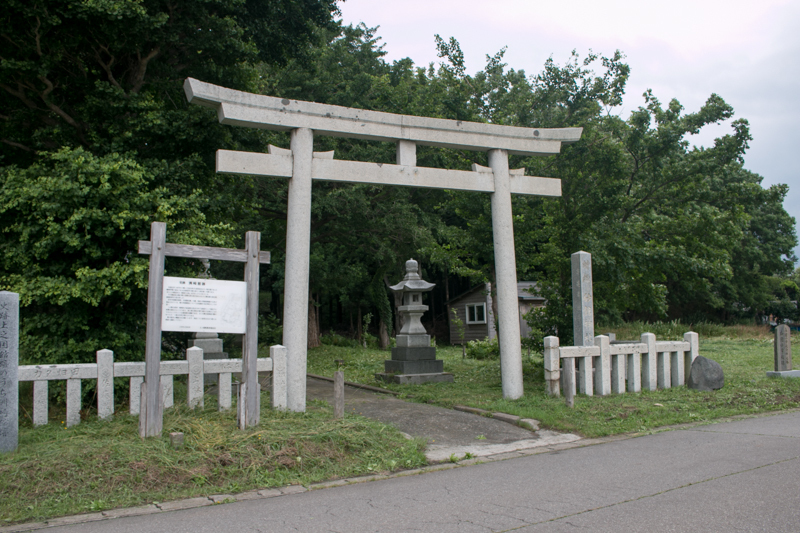 In 1456, a local person was killed by mainland people at Shinori town, arguing about the trade of iron item. 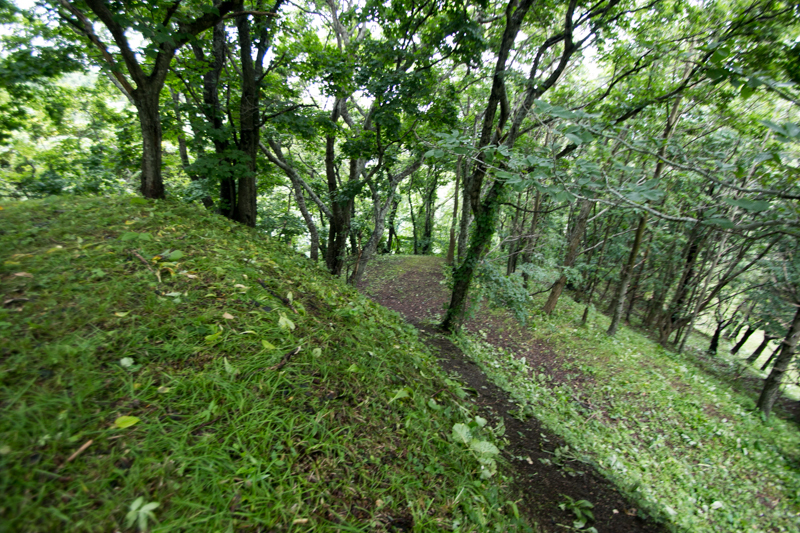 With this as a turning point, a huge rise lead by Koshamain (?-1458) occurred in 1457, for the first time in history. 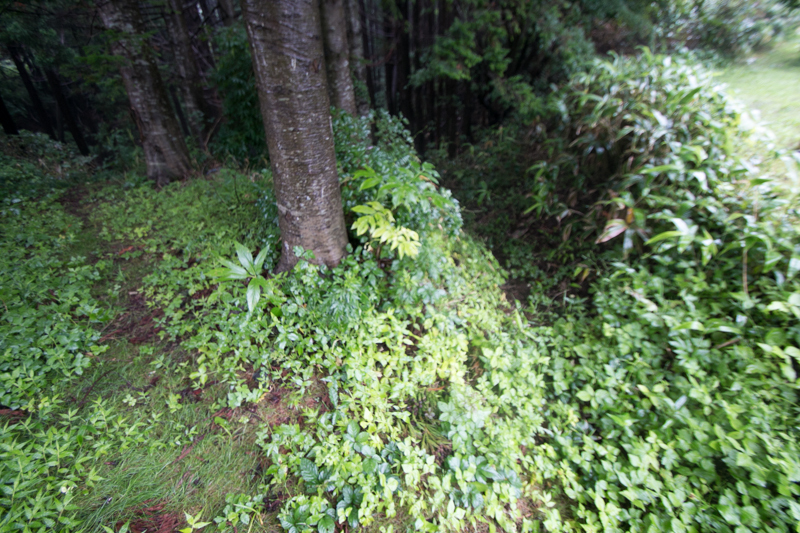 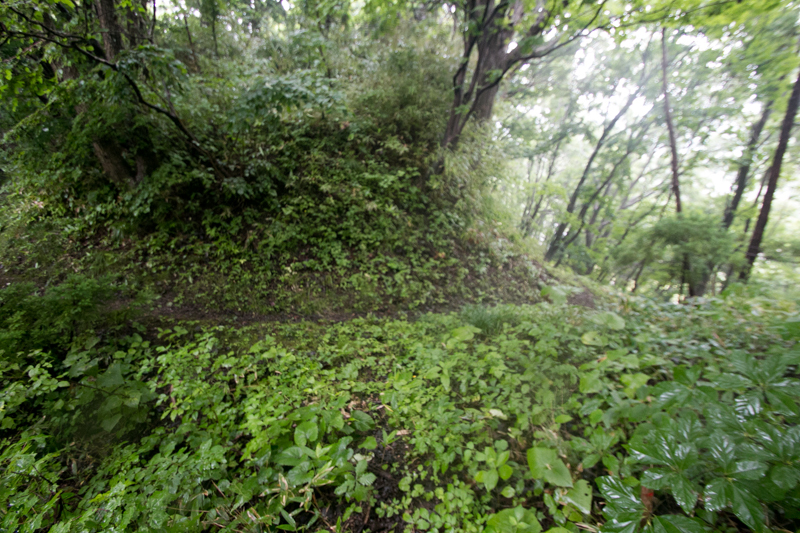 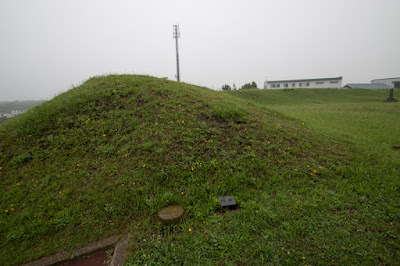 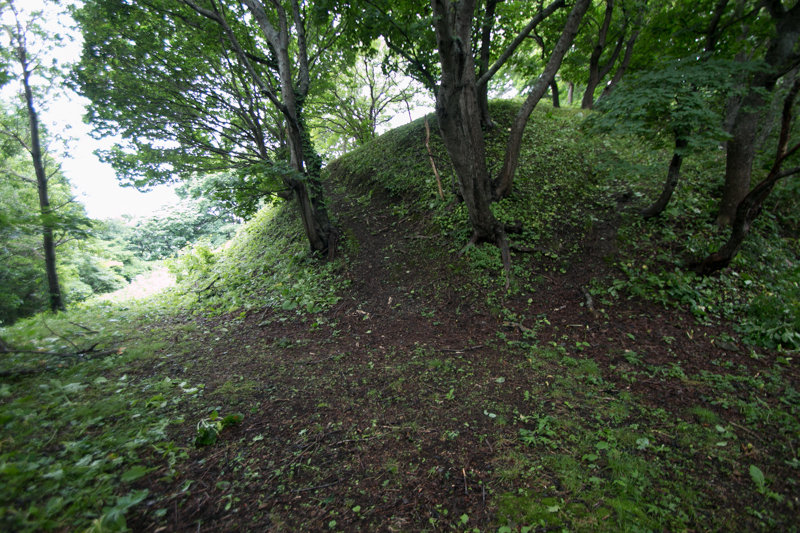 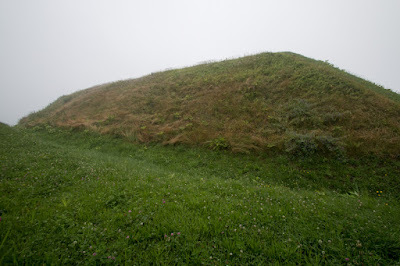 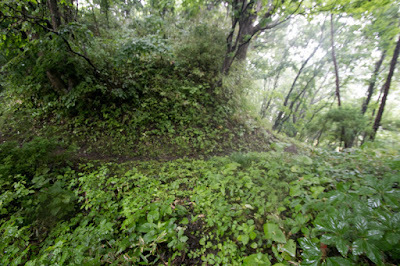 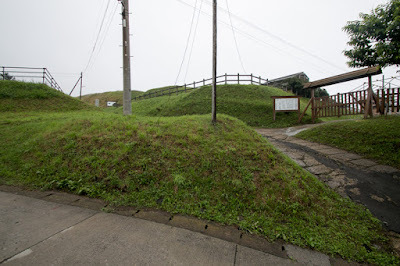 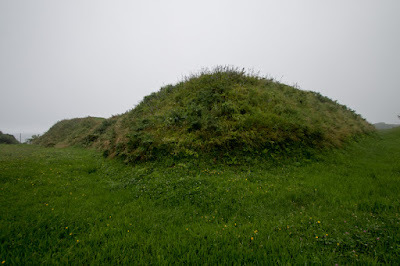 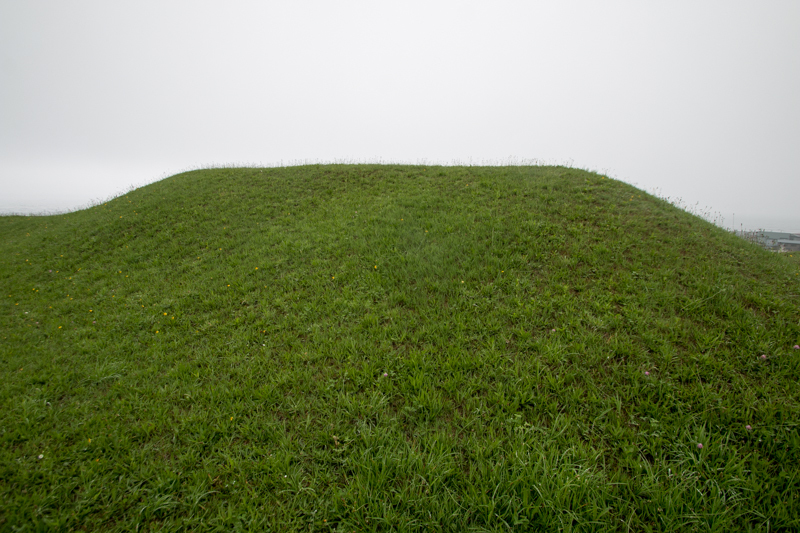 Ainu army assaulted Shinori castle, and Kobayashi clan which was the lord at Shinori castle died at the castle. Next rebellion army siege other castles, and 10 of 12 castles except for Mobetsudate and Hanasawadate fell by the attack. 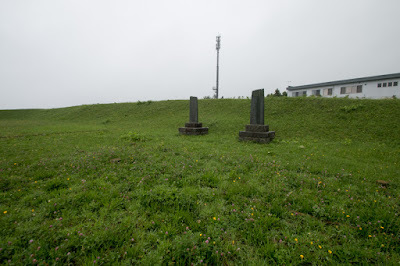 But Hanasawadate which was held by Sueshige Kakizaki (?-1462) and his guest general Nobuhiro Takeda (1431-1494) barely stroke back the attack of Ainu people. 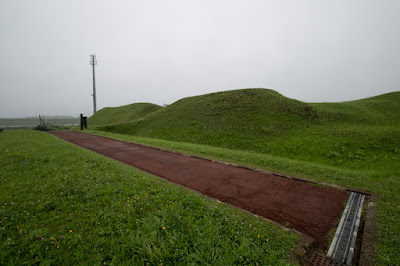 Later Sueshige and Nobuhiro formed their army and attacked Ainu army, and finally killed Koshamain in 1458 and ceased subjugated Ainu people. 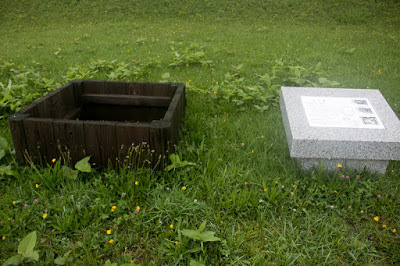 As other mainland lords died or lost their power during this rebellion, Kakizaki clan became the leader of mainland people in Hokkaido. 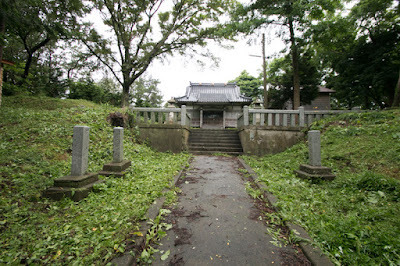 Nobuhiro became the son in law of Sueshige, and after the death of Sueshige, Nobuhiro succeeded Kakizaki clan. As a regional leader Nobuhiro built Suzakidate and Katsuyamadate at Kaminokuni town, and the period of 12 castles had ended. Shinoridate (志苔館) is located at the corner of the height facing Shinori river and Tsugaru straight, at the south of current Hakodate airport. 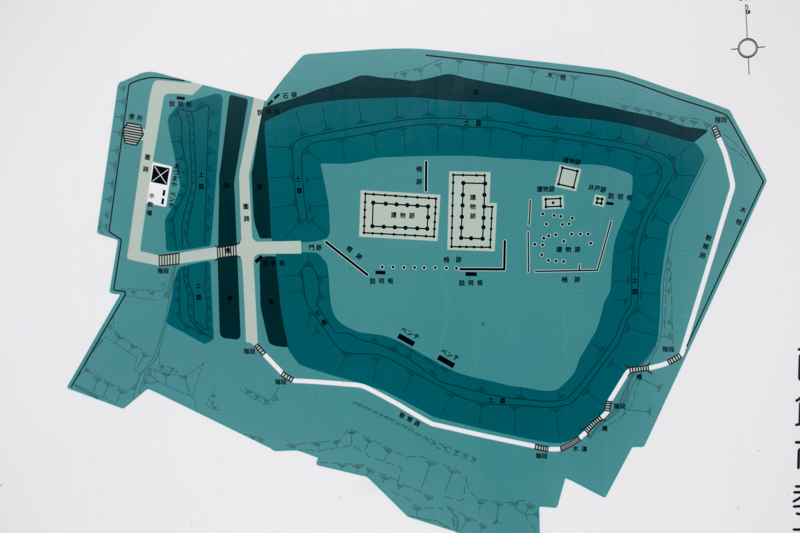 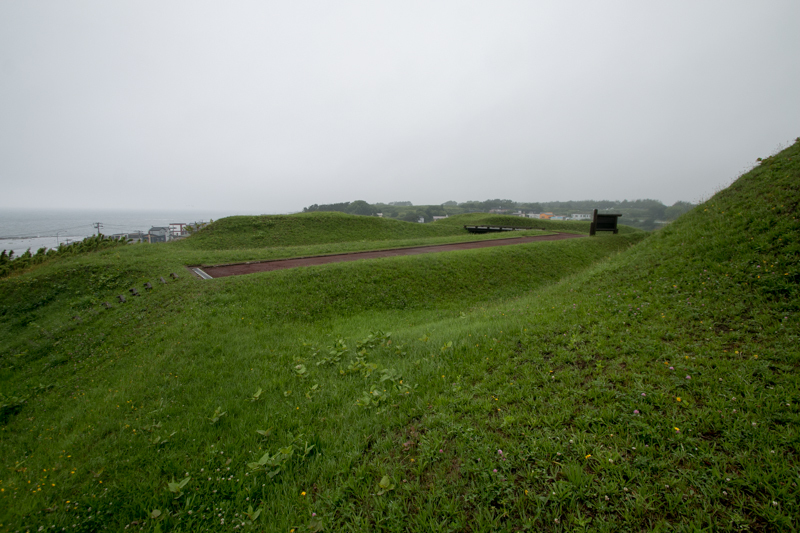 Main area of the castle is a rectangular area of 80 meter long and 40 meter wide, spreads eastward and westward. 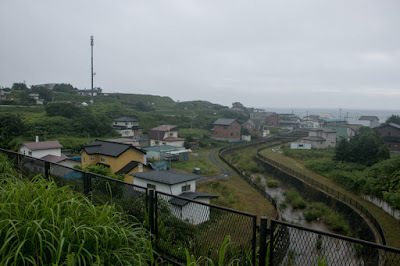 Just below of the castle a fishery port still exists, might be the same as before. Gate of the main area is built at its western line, and this gate is protected by line of clay wall and two layer of dry moats. 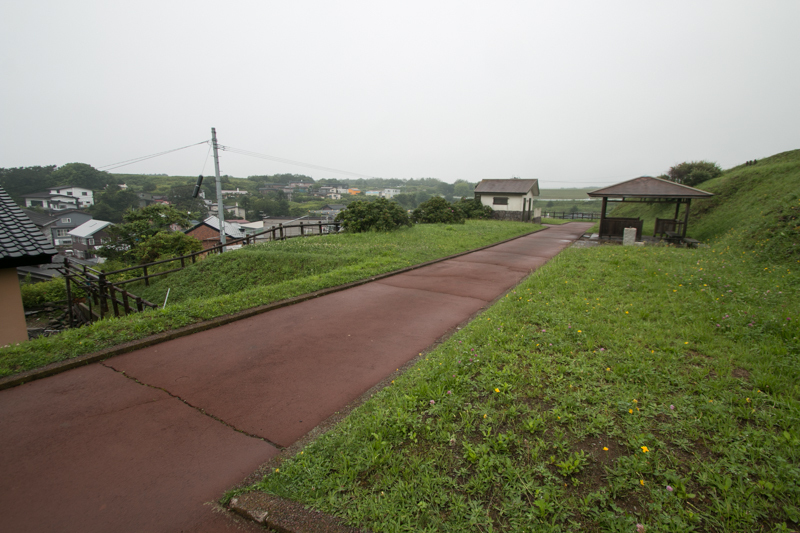 There might be several residential buildings in the main area, and this area is protected by over 2 meter clay wall and wide dry moat. 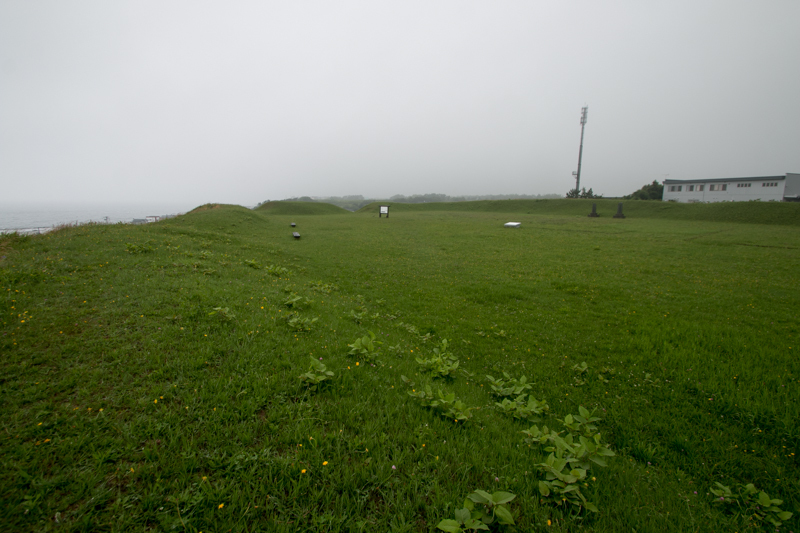 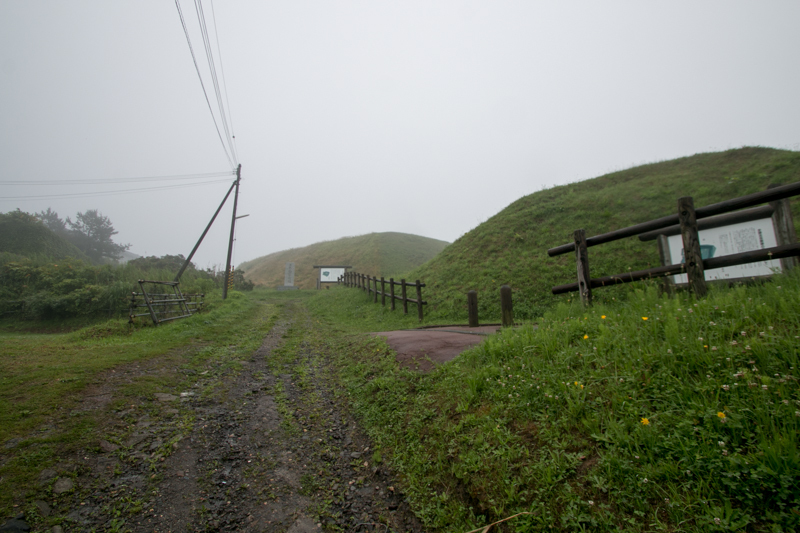 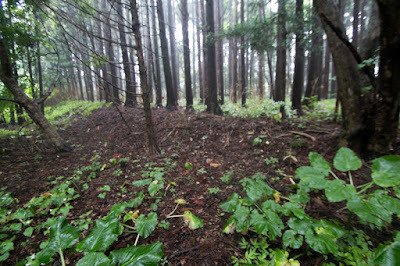 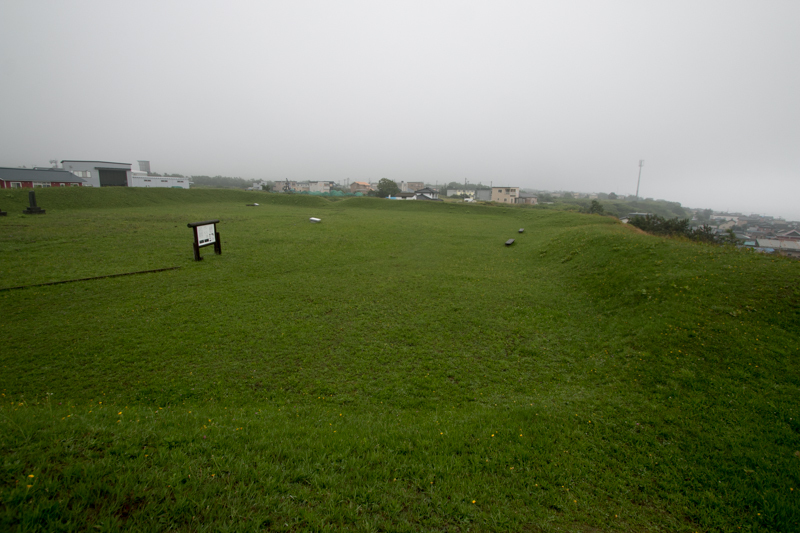 But this castle has only one area, and it might be difficult to resist against attack of huge Ainu army. 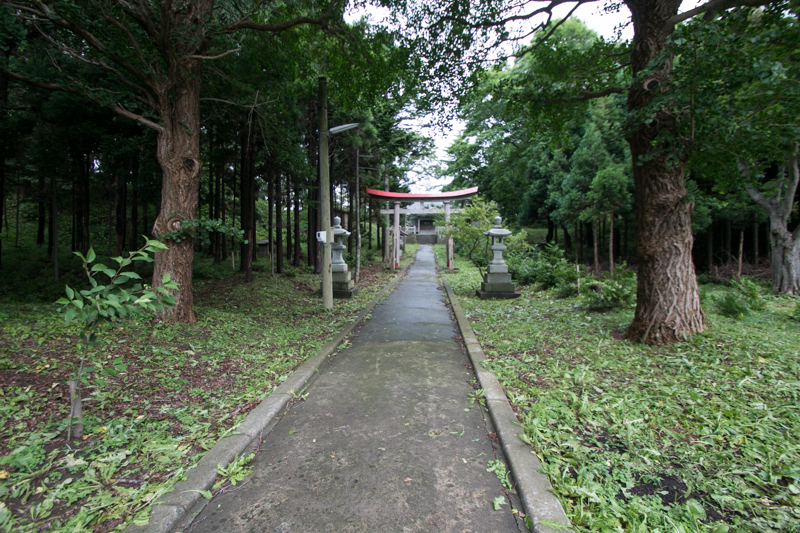 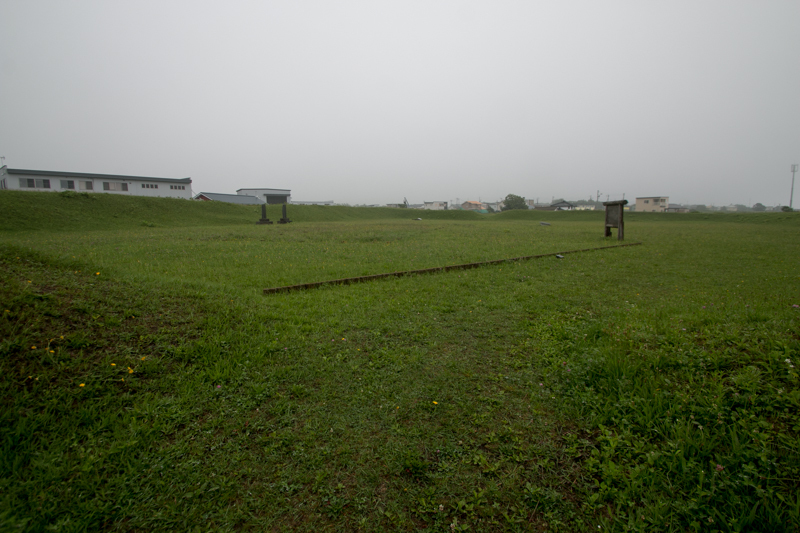 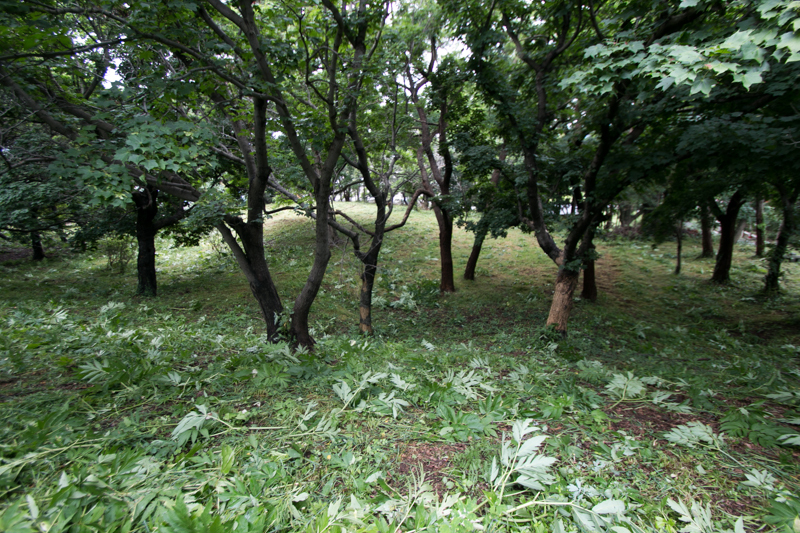 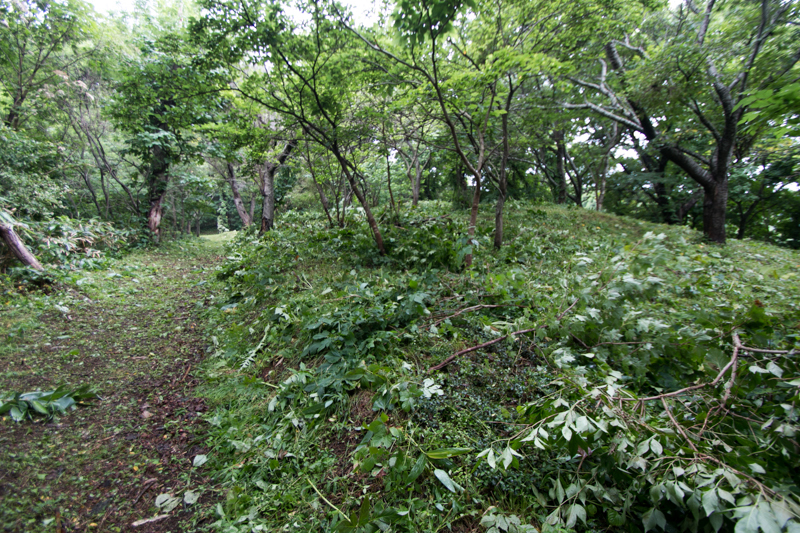 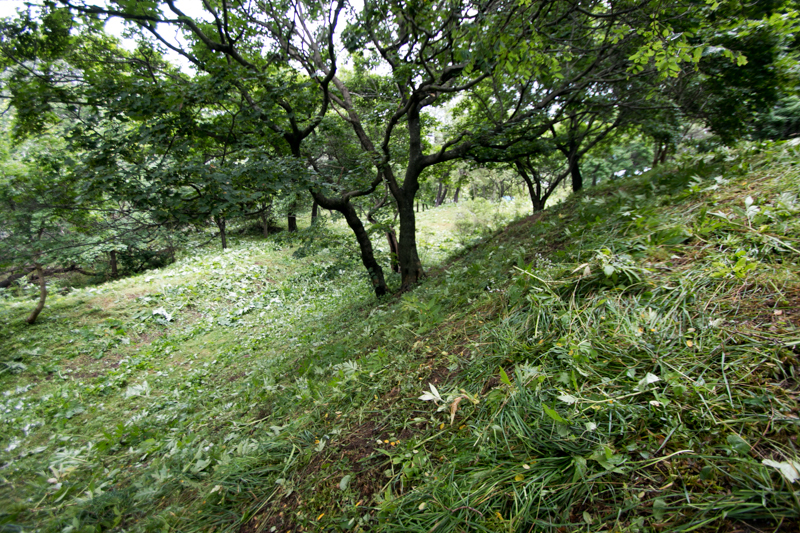 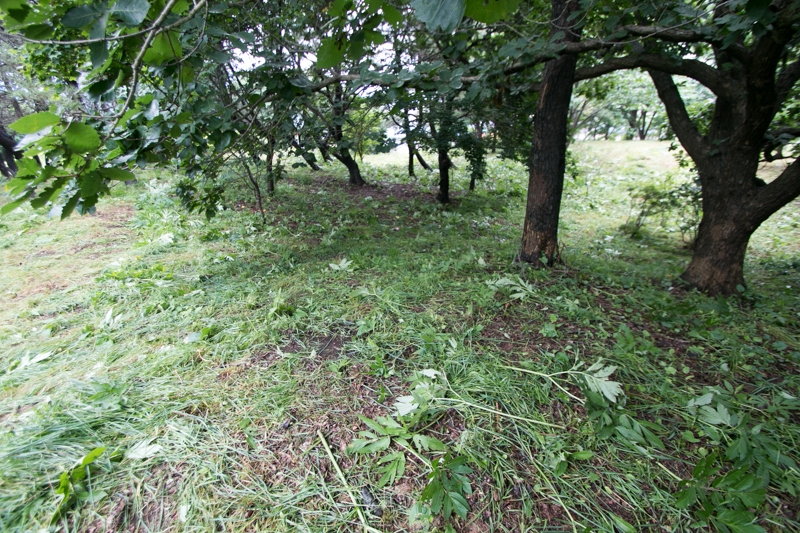 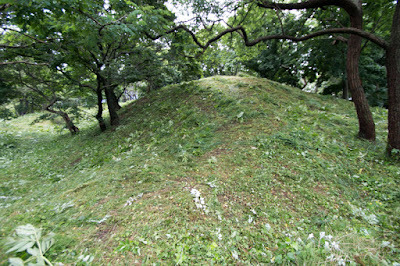 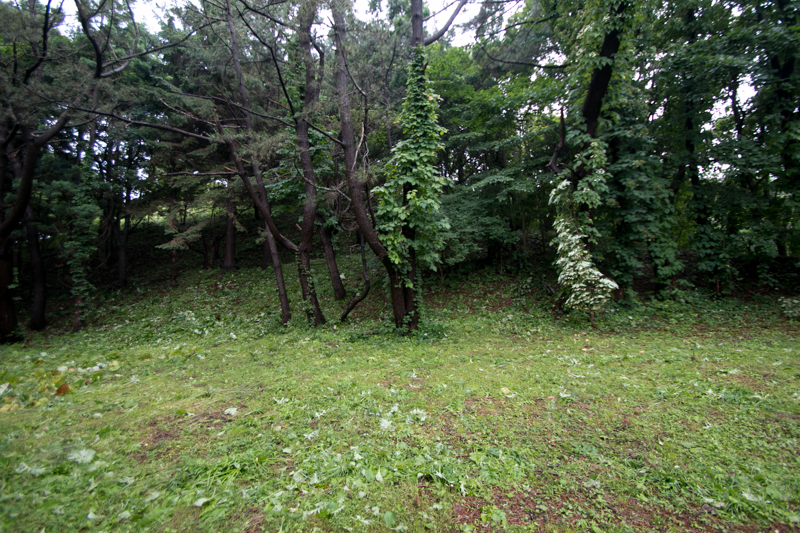 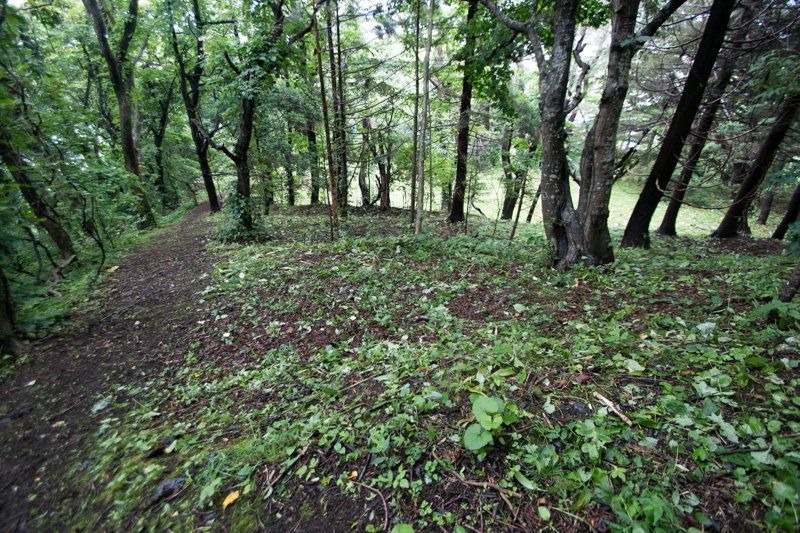 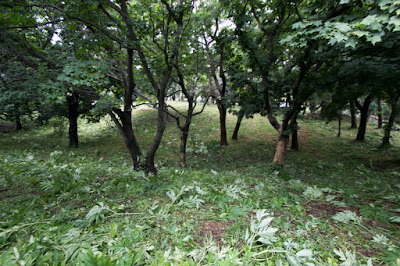 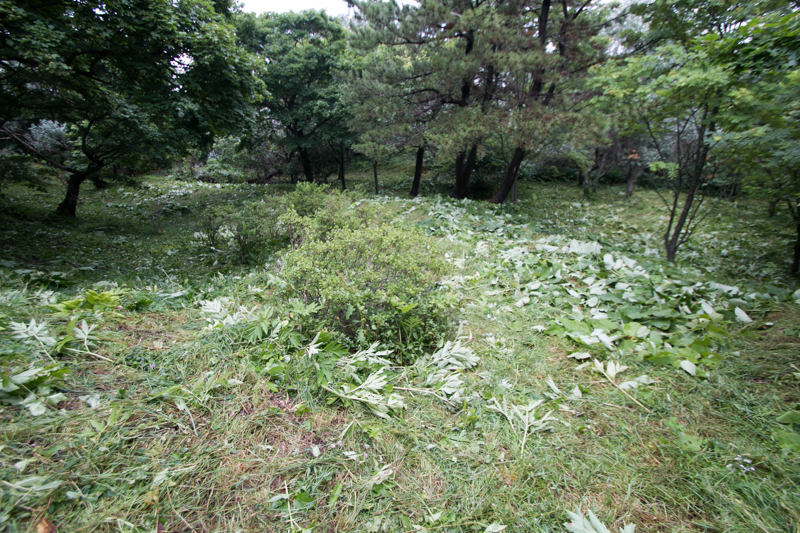 Currently the site of Shinoridate is maintained as a historical park. 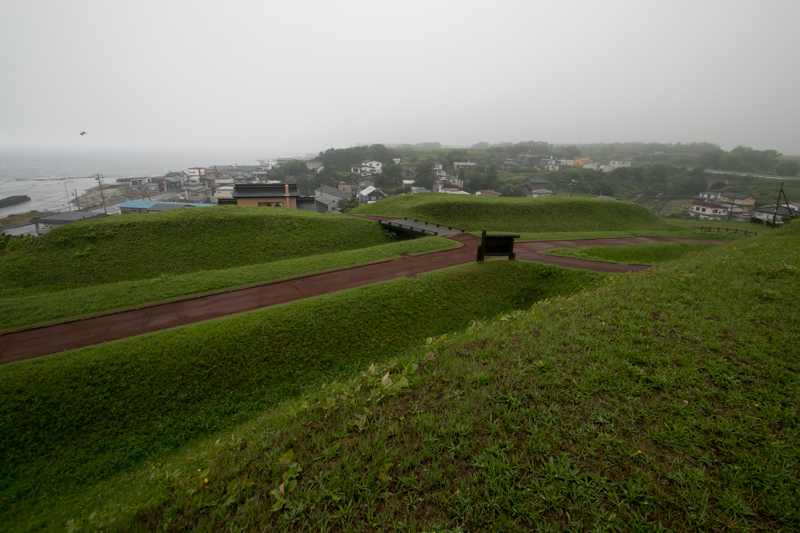 It is close to Hakodate city and easiest to visit. Odate (大館) located over the long and narrow hill in the north of Matsumae castle. 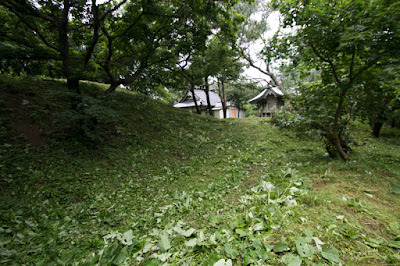 Whole shape of the castle is like a twisting candy package with large main flat area and two narrow paths at both edge. Main area of the castle is a huge one of 250 meter long and 50 meter wide, and seems separated into several areas by low clay walls. 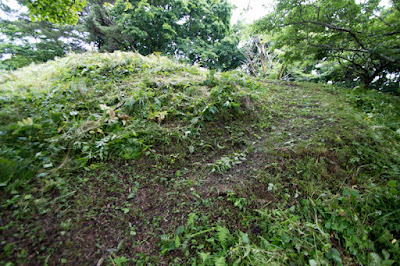 Both edge of the castle is securely protected by deep dry moats. 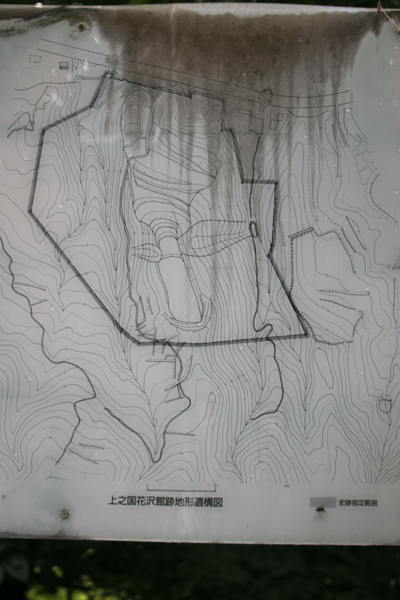 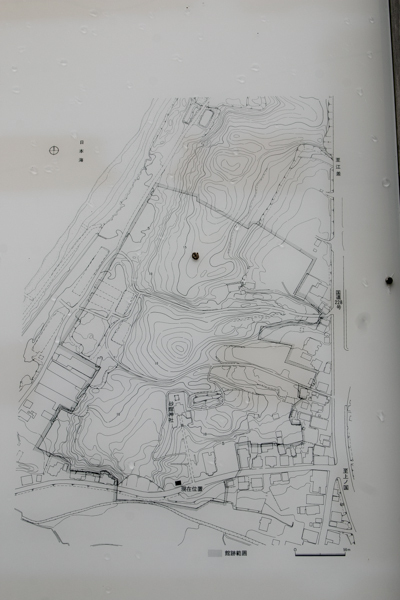 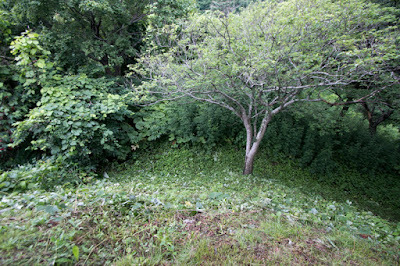 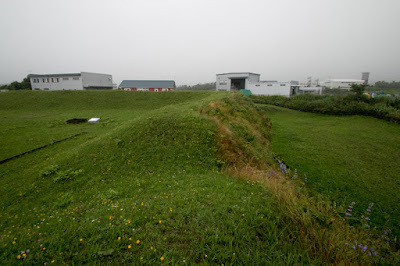 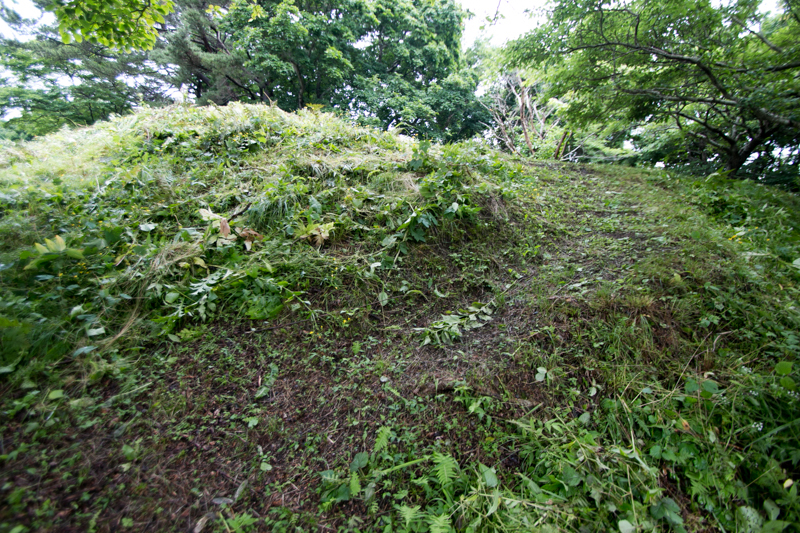 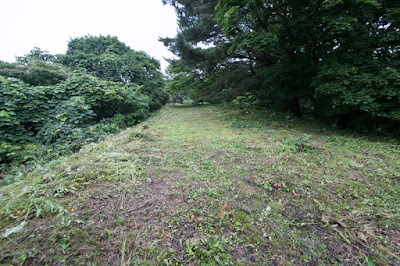 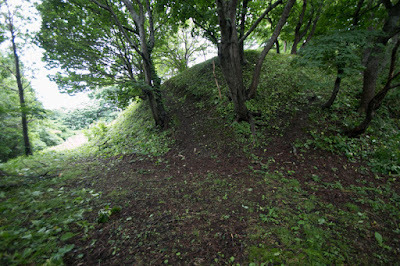 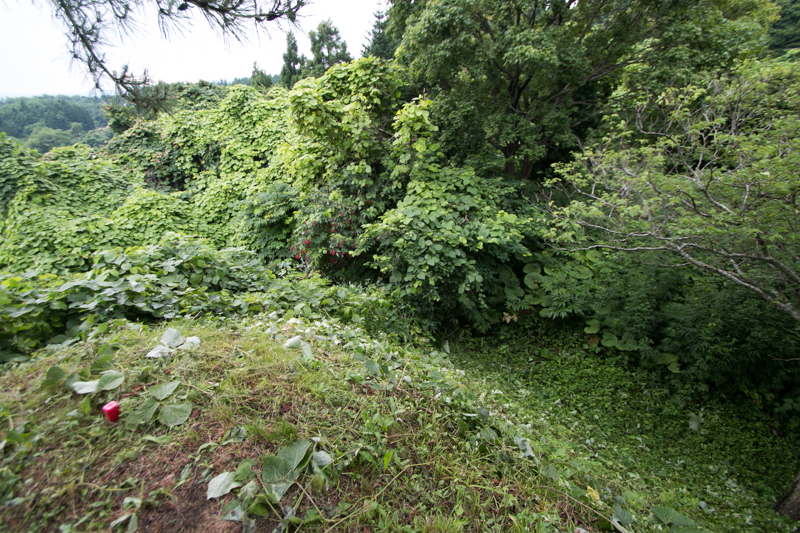 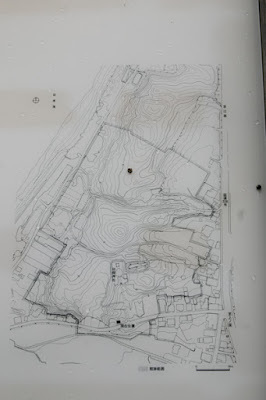 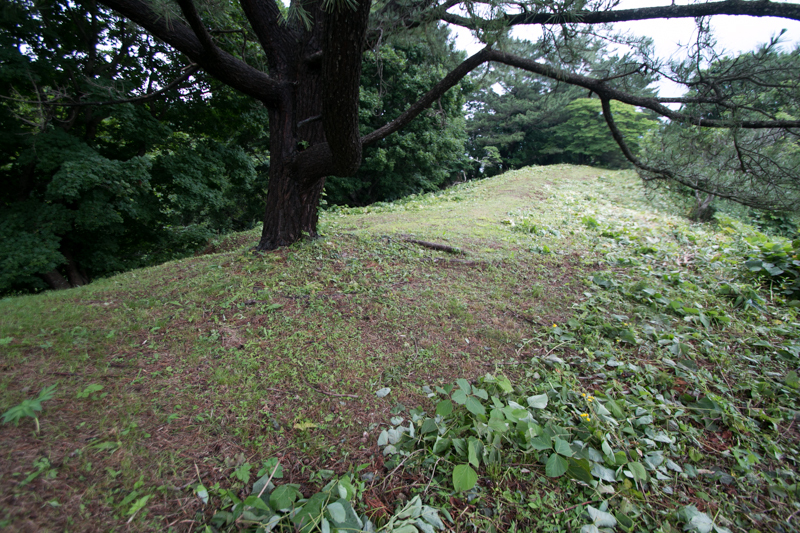 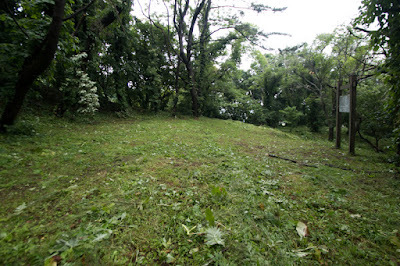 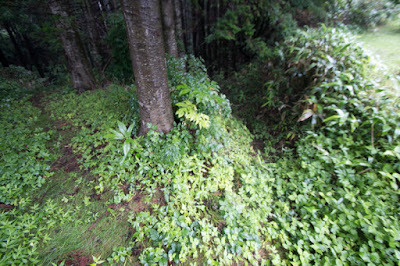 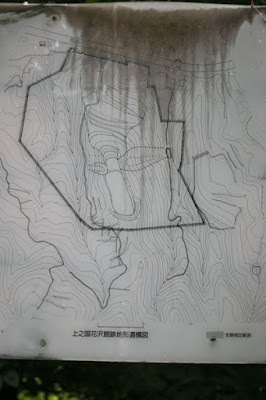 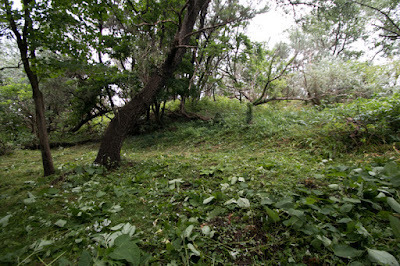 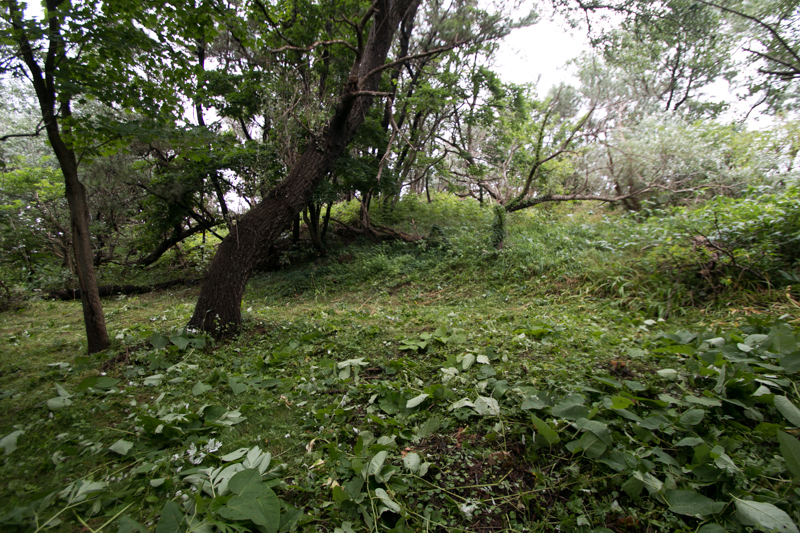 Especially north edge directly connects to the backside hill is guarded by two layer clay wall and dry moat, but webmaster couldn’t reach there because of heavy bush. 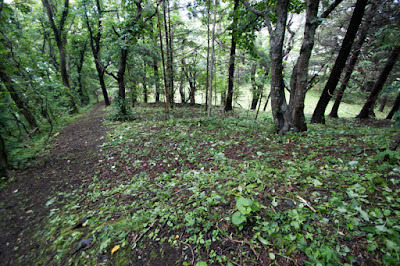 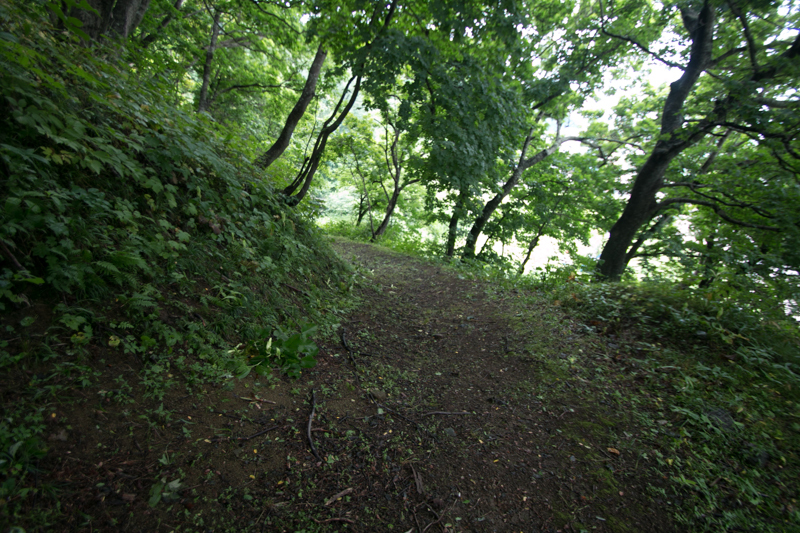 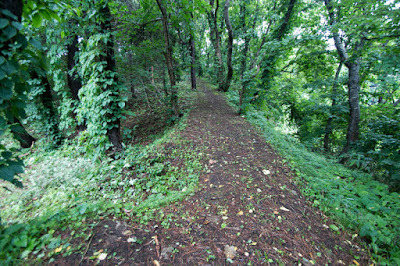 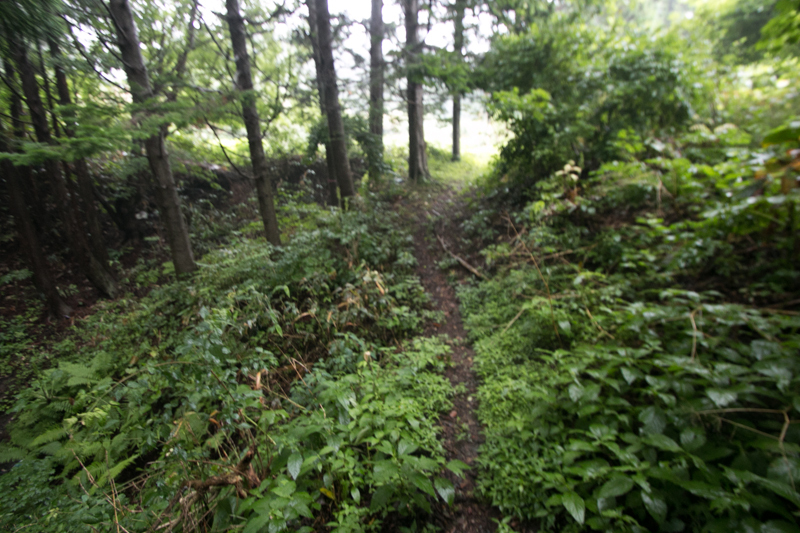 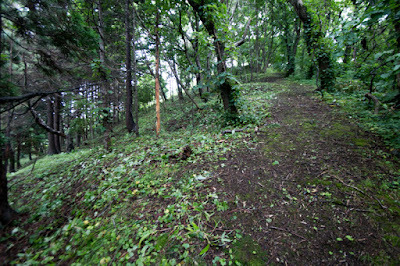 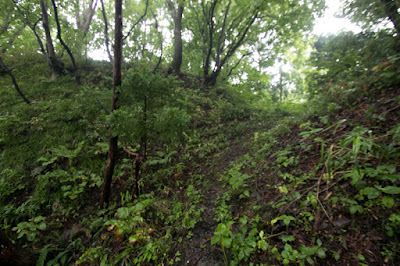 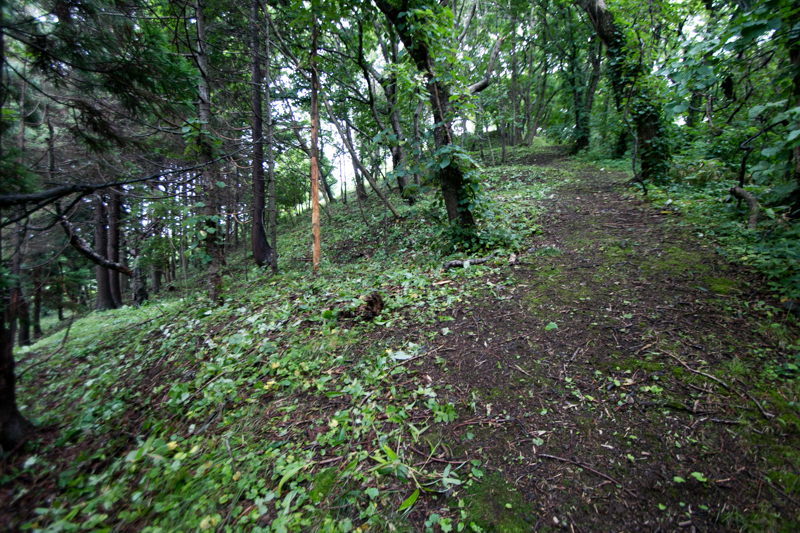 Climbing road to the castle is quite unidentifiable but at opposite side of small creek at the next of Matsumae Daijingu shrine. 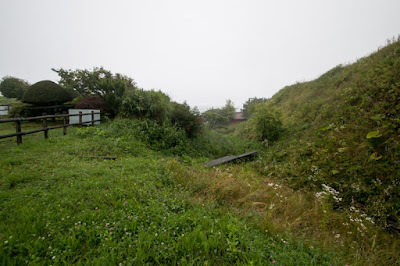 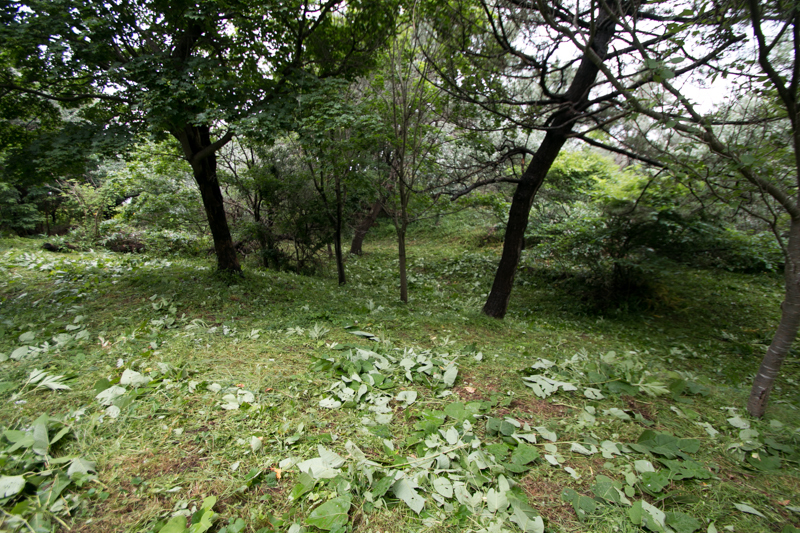 In 1811, Russian naval officer Mikhailovich Golovnin who measured Chishima islands at the north of Hokkaido island was captured by Edo Shogunate and had been confined at the hillside of former Odate over 2 years. 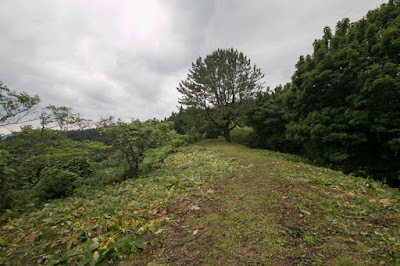 Hanasawadate (花沢舘) is built at the sharp ridge plunges into Amanogawa river. 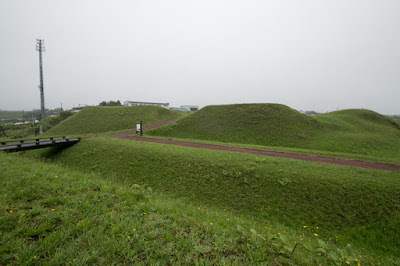 At 3 kilometer north of same continuous height, Katsuyamadate was built. 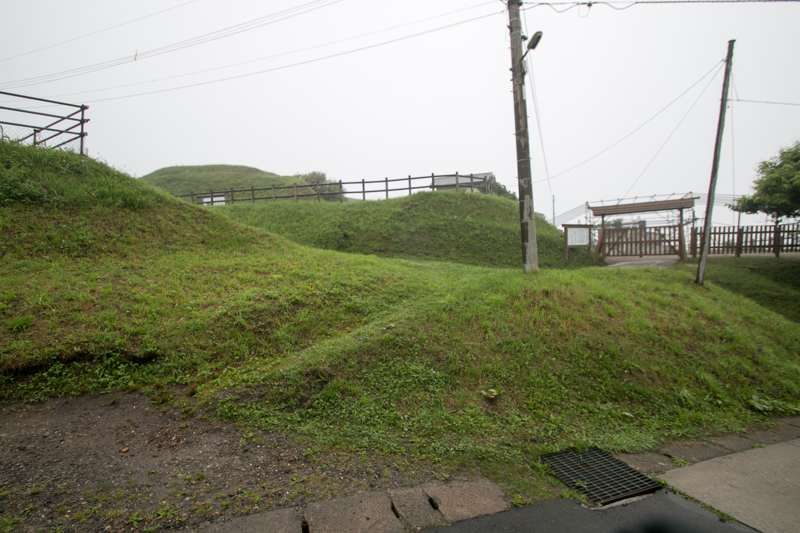 Unlike other castles, Hanasawadate is built at sharp hill of 40 meter height like a cut of cheese cake, and its front side is protected by numerous layer of terraces. 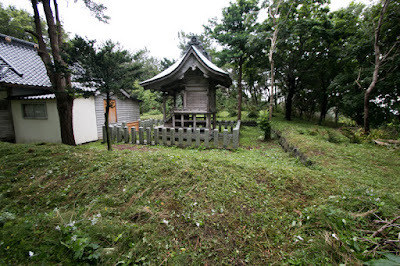 Because of this structure Hanasawadate might be able to stand the attack of Koshamain, and later Kakizaki clan built Katsuyamadate in the same manner of Hanasawadate, even though far larger. 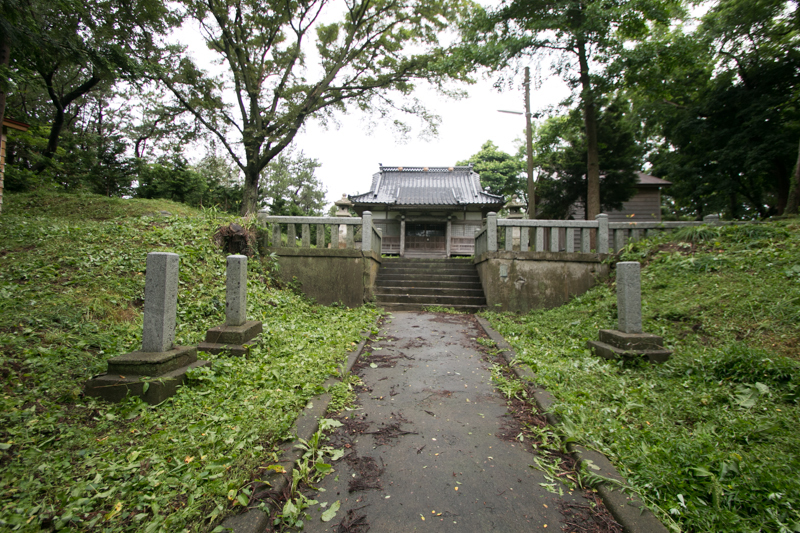 In 1609, Tadanaga Kazanin (1588-1662), a high class noble in Kyoto city, was exiled to Matsumae domain and lived at former site of Hanasawadate because of scandal. Tadanaga brought culture of Kyoto city to Matumae domain, and later was forgiven and returned to Kyoto city. It is said that Takeda Nobuhiro held a ceremony of establishing new domain here. 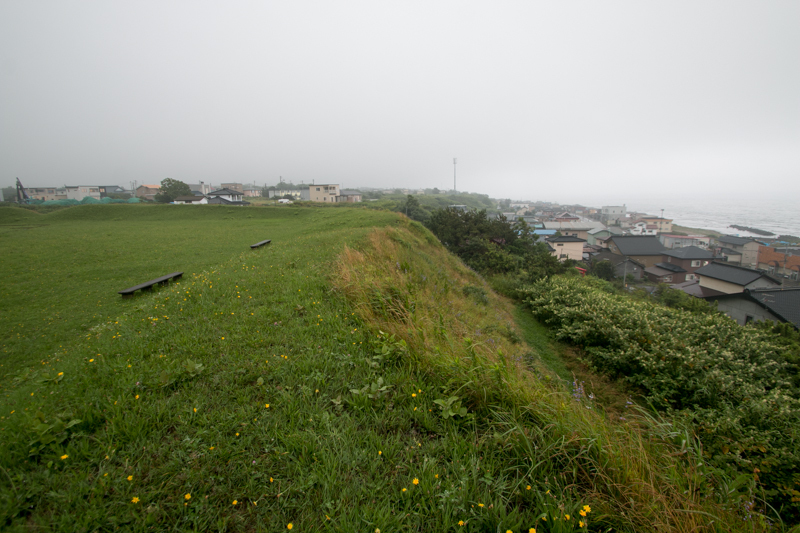 and it was the end of frontier period and start of medieval area at Oshima peninsula.